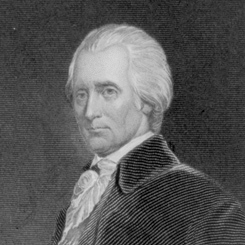 Image courtesy of Library of Congress A Member of the Continental Congress and signer of the Declaration of Independence, Richard Henry Lee of Virginia became one of the first Senators from the "Old Dominion" state. On this date, the Continental Congress agreed to declare independence from Great Britain. Delegate Richard Henry Lee of Virginia had earlier introduced a measure whereby the Congress resolved, “That these United Colonies are, and of right ought to be, free and independent States, that they are absolved from all allegiance to the British Crown, and that all political connection between them and the State of Great Britain is, and ought to be, totally dissolved.” Two days after Congress approved the resolution, it approved the formal document, the “Declaration of Independence,” on July 4, 1776. Fifty-six Delegates signed the document created by the “Committee of Five”: Benjamin Franklin of Pennsylvania, John Adams of Massachusetts, Robert Livingston of New York, Roger Sherman of Connecticut, and Thomas Jefferson of Virginia.